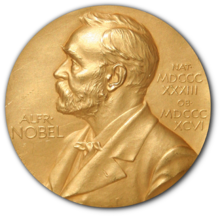 Nobel prizes are awarded for several categories in order to recognize academic, cultural, and scientific advancements in the world. The prizes are given in chemistry, literature, peace, physics, and physiology, with the results of some (notably literature, peace, and physics) being more widely celebrated than others. The Nobel Peace Prize in particular usually celebrates a beloved leader or figure that is frequently in the public eye. But while we usually recognize the winners of this prestigious award, how many of us know what the medal itself looks like, or any of the history behind it? As trophy experts – we do! Read on to learn a little more about the background of this object recognizing humankind’s incredible achievements. What kind of award is it? This entry was posted in Uncategorized on August 26, 2015 by Spike's Trophies. Not every trophy is shiny, metal and mantle-ready! We’re straying a bit off the beaten path with this one, but the Green Jacket is such an important symbol of achievement in the sports world that we just had to include it. Awarded to the winner of the Master’s Tournament, this garment represents the most coveted title in golf. It’s got an interesting history, too – read on to find out more about this revered prize!